Internet: Ruby was born November 12, 1939. Truth: Although it's ok to wish her "Happy Birthday" in November, she was actually born on June 15, 1934. Internet: Her name is Ruby Nash Curtis. Truth: She was never married to anyone named "Curtis." In 2008, she will have been Ruby Nash Garnett for 42 years. Internet: Ed Roberts was the first tenor and George Lee was the second tenor. Truth: The parts are reversed. Internet: She joined a group called the "Supremes," which then changed its name to the Romantics. 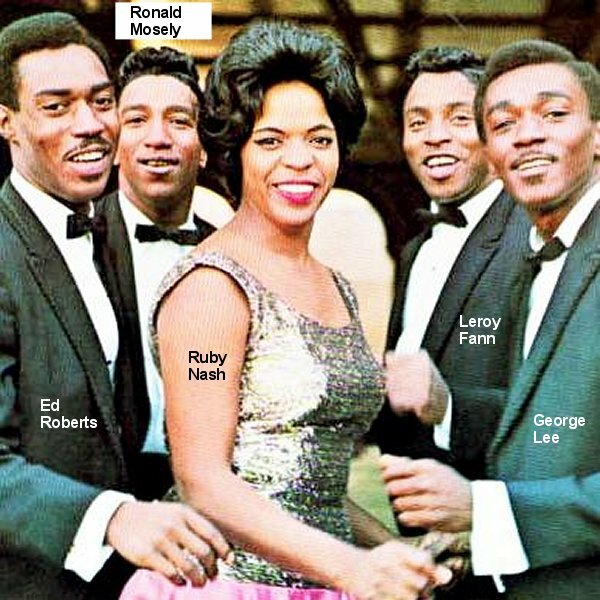 Truth: The group had fooled around with several names before Ruby joined, and "Supremes" was one of them. However, when she joined, the group was called the "Feilos." 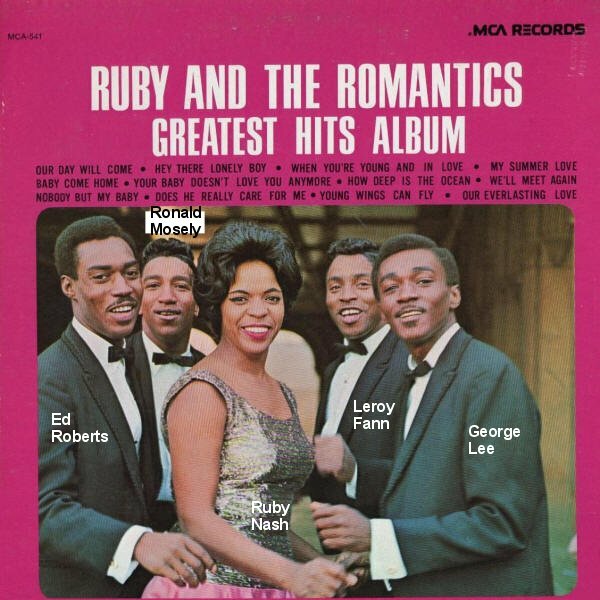 Internet: In 1966, the Romantics broke up and Ruby teamed up with Ronald Jackson, Robert Lewis, Vincent McLeod, and Richard Pryor to record, as the new Romantics, for ABC. Then, in 1969, the Romantics became all-female, when those guys were replaced by Denise Lewis and Cheryl Thomas on A&M. Truth: From the time Ruby joined in 1961 through their breakup ten years later, the membership of the Romantics was constant. 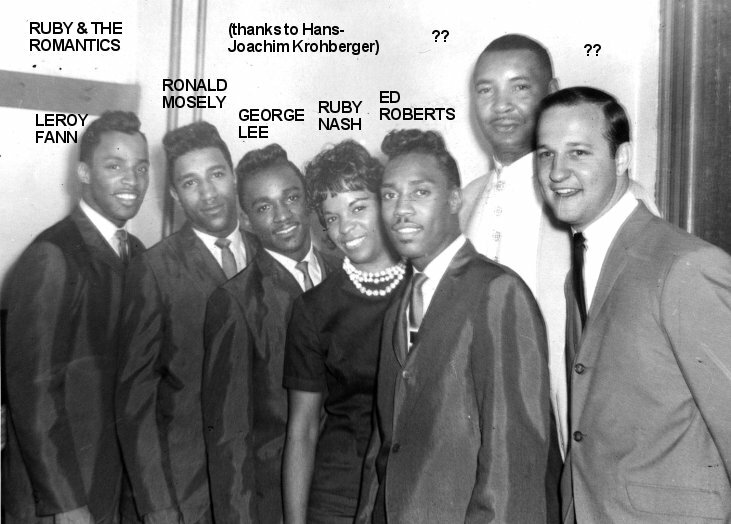 Ruby not only never sang with any of the people listed above, she never even heard of any of them. Let's see if we can clear all this up. 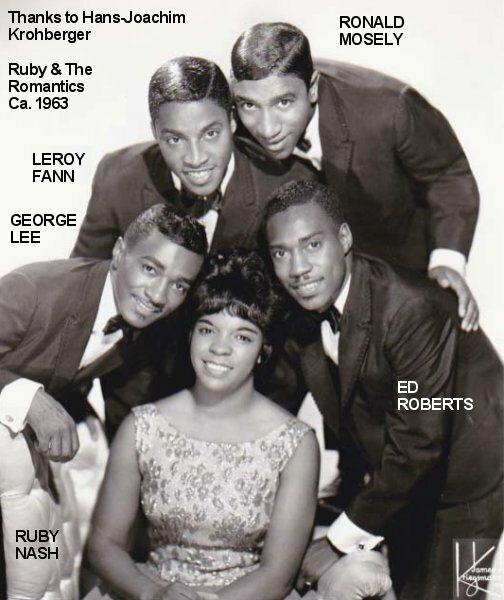 The group that was to become the Romantics began in Akron, Ohio around 1958. There were loads of groups in Akron at the time. "Everybody sang," says Ruby. Many of these groups hung out at the Akron Community Center, where they would form, break up, and re-form. 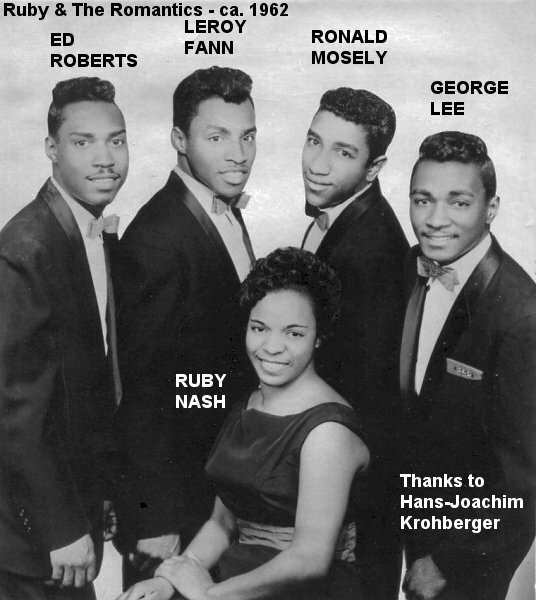 The real beginnings of the Romantics go back to the Skarlettones, a group that formed in Akron in late 1958. The members were Ronald Mosely, James Porter, Columbus Mitchell, Robert Carter, and Willie Tucker. Unfortunately, their history is unknown, but they ended up recording "Do You Remember"/"Will You Dream" for George Goldner's End label in mid-1959. When that failed to take off, Ronald Mosely (baritone) and James Porter (first tenor) joined with Ed Roberts (second tenor), Arthur Atkinson (baritone/bass), and Leroy Fann (bass). For a while, they were known as the "Embers," but by the time they decided to go to New York to record, they were calling themselves the "Supremes." The Supremes had a single record for APT, a subsidiary of ABC-Paramount: "Another Chance To Love"/"Fidgety," released in December 1960. When the APT recordings didn't take off, James Porter and Arthur Atkinson left the Supremes in early 1961. Ed Roberts, Ronald Mosely, and Leroy Fann then recruited first tenor George Lee, and the group, now a quartet, changed its name once again. This time they called themselves the odd-sounding "Feilos" (pronounced "FAY-lows"). 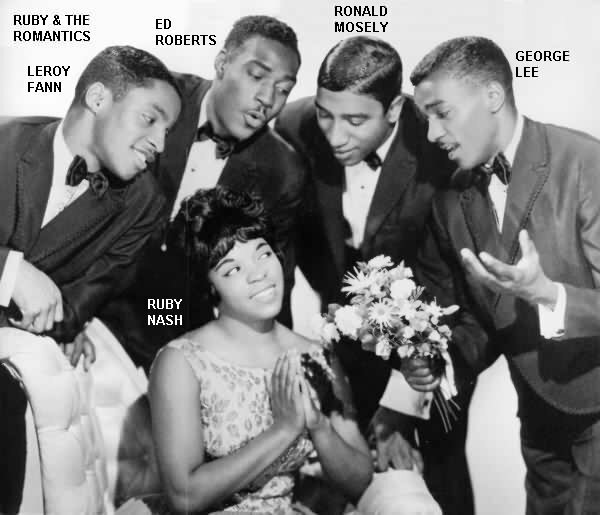 Sometime in 1961, Ruby Nash found herself in a group singing in a talent show at the Akron Community Center. Ruby had no background in singing ("I just sang around the house"), but sooner or later, it seemed, everyone ended up singing at the Center. This group probably had a name, but Ruby has long since forgotten it. (Not surprising, since the group only existed for that single performance.) Aside from Ruby, the group had her sister, Betty, a couple of other girls, and one guy. As luck would have it, Leroy Fann was there that night. The Feilos had decided that they weren't going anywhere and needed a different kind of sound. Leroy was impressed with Ruby's singing and asked her to audition for the group. Soon the group was back to five. At the time, Ruby was the oldest, at 27. The guys were at least a couple of years younger, but all of them were married. They started rehearsing in earnest and began playing venues in Akron and Cleveland (around 35 miles away). They had a large repertoire (of all the current hits) and each of them took turns singing lead. Was there a special influence on Ruby's style? Nope: "I listened to everything; I had no special group." After around a year's practice, they felt they were ready to try their luck again. In October 1962, they once more piled into a car and drove the 400 or so miles to stay with a friend in New Jersey. They were poised to hit Manhattan and the Big Time. Stanton took his time with the Feilos. For over five hours he had them sing every song they knew. When they came back the next day, he told them two things: first, he wanted Ruby to front the group from then on (remember, they'd all been doing leads), and second, the "Feilos" were history. Stanton unilaterally (and quite wisely) decided that the group would now be known as "Ruby and the Romantics." Then came the chore of deciding what they should record. (These things only seem easy when you're buying records. It's a lot harder on the other end.) Stanton played them demo after demo to see what they'd like. "We spent a week listening to demos," remembers Ruby. One that caught Ruby's ear was a tune by Bob Hilliard and Mort Garson, "Our Day Will Come." However, Stanton was reluctant to have an unknown group record that one, because everyone agreed it had hit potential. Hilliard and Garson were pushing to have Jack Jones record it (he'd just scored a minor hit for Kapp with "Lollipops And Roses"). Every day, Ruby would ask again if they could record "Our Day Will Come." Finally, Hilliard and Garson relented: the Romantics could have first crack at it, but if it failed to take off, Jack Jones would get it. Finally the big day came: October 25, 1962. The first track laid down was "Moonlight And Music," written by Leroy Fann. Then they got to work on "Our Day Will Come." They did several takes, but it just didn't seem right. While they were taking a break, the drummer started fooling around with a beat based on Stan Getz and Charlie Byrd's recent hit, "Desafinado" (the Brazilian bossa nova was first making itself heard in the U.S.). Everyone seemed to like it and the Romantics nailed the song in the next take. (Sadly, Ruby doesn't remember the drummer's name, but guitar legend Kenny Burrell was on the session.) They finished up with "By The Way" and "Don't Let Him In." Of course, with a hit record, the touring grind began. 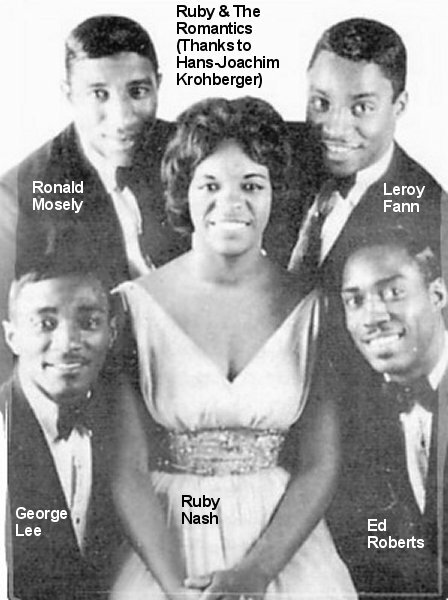 On March 8, they began a week at the Apollo Theater, along with Shep and the Limelites, Mary Wells, Jimmy McGriff, King Coleman, and the Chantels. They also played the Howard (in D.C.), the Royal (Baltimore), the Regal (Chicago), the Uptown (Philadelphia), and even the Akron Amory (scene of Alan Freed shows in days gone by). Now they'd had a hit record and a tour. One thing they didn't have was a manager. "We were so new that we didn't know the music business at all," says Ruby. 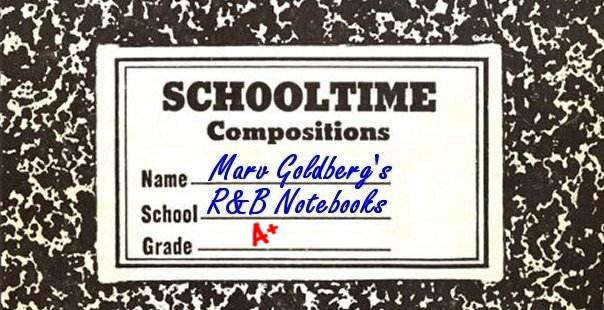 Somehow, Manny Greenfield, of the Greenfield Associates booking agency, became their manager. In March 1963, Kapp released the Romantics' first LP. Entitled Our Day Will Come, it featured not only their first two sides, but several "standards" ("My Prayer," "The Masquerade Is Over," "Heartaches," and "I Don't Know Why"), as well as versions of more recent tunes ("Stranger On The Shore" and "The End Of The World"). This was unusual for that time: only one single and already an LP. 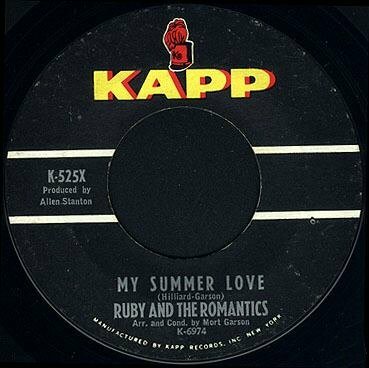 Kapp followed up with their next single, "My Summer Love"/"Sweet Love And Forgiveness," in April 1963. "My Summer Love" (another Hilliard and Garson tune) didn't do badly, reaching #16. These tunes were released to coincide with their next appearance at the Apollo (the week beginning April 12). 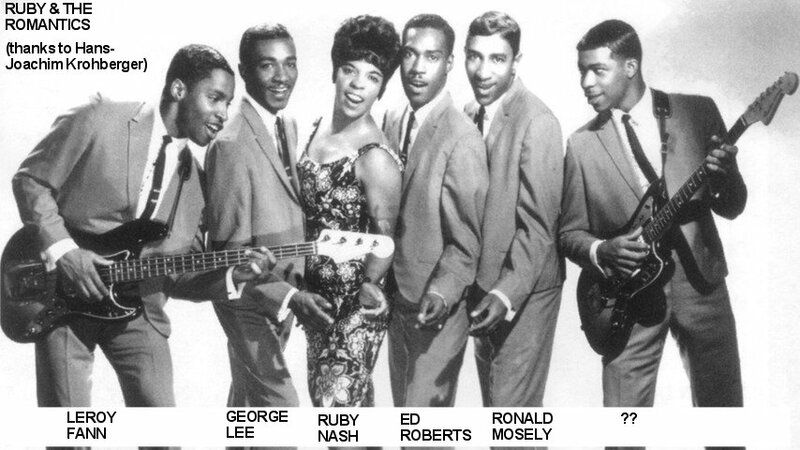 This time, they were part of a Jocko show, along with the Chiffons, Bob B. Soxx and the Blue Jeans, Theola Kilgore, Jimmy Soul, Jimmy Holiday, and the Percells. Remember that at the Romantics first session they'd recorded "Don't Let Him In"? While Alan Stanton had decreed that Ruby Nash would sing lead on all the songs, sometimes there was an exception. This one was led by George Lee, and Ruby had sat it out. The same had happened at the "My Summer Love" session, when the guys had recorded "Dance What You Wanna." Those two sides were released, in May, as by "George E. Lee" (in other words, Ruby isn't on them and the Romantics aren't mentioned at all). In July, Kapp issued "Hey There Lonely Boy"/"Not A Moment Too Soon." Once again, a Romantics' song charted, with "Hey There Lonely Boy" reaching #27. The song itself had great potential: in 1969, Eddie Holman rode the re-named "Hey There Lonely Girl" to #2. This was another case of a record being released to coincide with an appearance at the Apollo. This time (the week of July 5), they shared the stage with Brook Benton, Betty Carter, and Irwin C. Watson. Their next record, in September 1963, was "Young Wings Can Fly" (Higher Than You Know)," which reached #47. Its flip was "Day Dreaming" (which had appeared on their Our Day Will Come album). Both had been penned by Hilliard and Garson. The Romantics' second album, Till Then, was filled with standards, including "Moonglow," "P.S. I Love You," "Till There Was You," "Till Then," "Time After Time," "What A Difference A Day Made," "Imagination," "Dream," and "You'd Be So Nice To Come Home To." It was probably released in November, around the time that they returned to the Apollo Theater (on the 22nd), as part of a show featuring Sam Cooke, Mary Wells, Dean & Jean, Clay Tyson, and Reuben Phillips. While it was Alan Stanton's idea for them to do the standards, "it was fine with us," says Ruby. On January 4, 1964 there was a session at which three "George E. Lee" songs were recorded (the four guys, without Ruby): "Nothin' But The Blues," "The Possum," and "Every Day, Every Night." None of these was ever released. In February 1964, Kapp issued "Our Everlasting Love" (which peaked at #64), backed with "Much Better Off Than I've Ever Been." During the week of February 28, there was another appearance at the Apollo. This time they were part of a show with Chuck Jackson, the Sapphires, and Dionne Warwick. June 1964 saw the release of two more songs written by Hilliard and Garson: "Baby Come Home" (which rose to #75) and "Everyday's A Holiday." They were back at the Apollo on the 5th, with Mary Wells, Irma Thomas, and the Orlons. Their next record, "When You're Young And In Love" (issued in September 1964), slightly reversed the Romantics' downward trend, climbing to #48. (In 1967, the Marvelettes would have a #23 hit with it.) It's flip was "I Cry Alone." Around October 1964, Kapp decided, for unknown reasons, to reissue the "George E. Lee" record from the prior year. It was given a new record number, but met with the same lack of success. The Romantics returned to the Apollo on November 6, along with the Coasters, Maxine Brown, the Crystals, Shep & the Limelites, and Reuben Phillips. "Does He Really Care For Me" was released in January 1965. 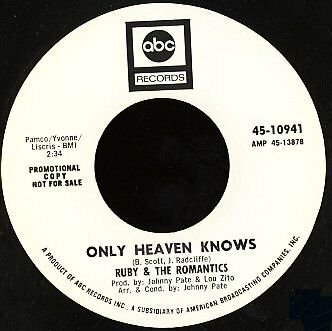 Reaching #87, it marked the last appearance of Ruby and the Romantics in the top 100. The flip was the old standard "Nevertheless (I'm In Love With You)." It was back to the Apollo on March 26, as part of a show with Brook Benton, Jimmy Reed, King Curtis, Dobie Gray, Clay Tyson, and Spizzie Canfield. Then, in April, Kapp released the World War 2 weeper, "We'll Meet Again," backed with "Your Baby Doesn't Love You Anymore." "We'll Meet Again" was ranked as #108. "Imagination," another oldie, was the group's next record. It was coupled with "Nobody But My Baby" for a September 1965 release. The Romantics' third LP was 1966's Greatest Hits Album. With the exception of "How Deep Is The Ocean," all the tunes on it had been released on singles. It was aptly named, since it really did contain every one of their songs that had charted to date. In September 1966, Kapp issued "Think." 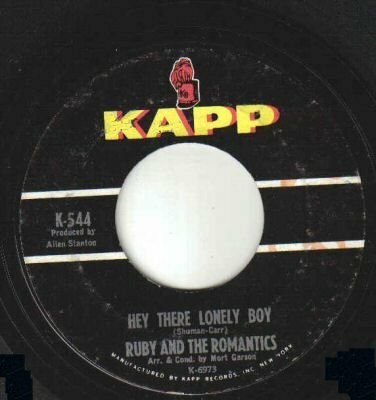 Its flip was a reissue of 1963's "Hey There Lonely Boy." 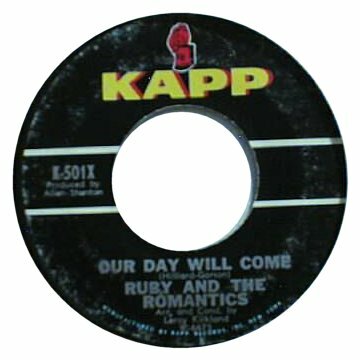 Their fourth and last Kapp LP, Ruby And The Romantics, was issued late in 1966. All of its tracks had previously been released on singles. On December 9, 1966, the Romantics spent a week at the Apollo Theater as part of a George Smith Oldies Show. They shared the stage with Clyde McPhatter, Frankie Lymon, Ruth Brown, Sonny Til & the Orioles, Charlie & Ray, the 5 Keys, and Vivian Reed. After this, the Romantics switched over to ABC. Ruby believes that their contract was bought out by ABC, but she's not sure. Kapp Records must have been somewhat chaotic at this point, since Dave Kapp was negotiating to sell the company to MCA. At ABC, they held their first session on February 20, 1967. This led to "Twilight Time"/"Una Bella Brazilian Melody," issued later that same month. In May, when there had been no chart action on either side, ABC released two more tunes from that session: "This Is No Laughing Matter"/"Only Heaven Knows." Neither of those charted either. In July 1967, Kapp (which may or may not have been taken over by MCA yet) issued the last original single by Ruby and the Romantics: "I Know"/"We'll Love Again"; both were masters from 1963. 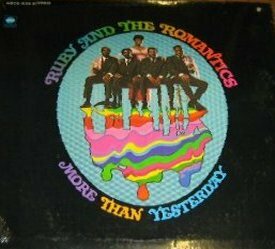 In early 1968, ABC tried to lift the Romantics out of the doldrums by issuing an LP called More Than Yesterday. It contained "Una Bella Brazilian Melody" and "This Is No Laughing Matter," along with their renditions of some recent hits: "People," "Up Up And Away," and "What The World Needs Now Is Love." The last ABC single came out in March 1968: "On A Clear Day You Can See Forever"/"More Than Yesterday Less Than Tomorrow." Both sides were taken from the LP. However, with no chart action, the Romantics were definitely in a slump. 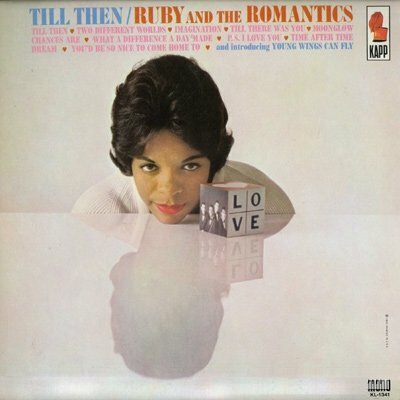 In 1969, Ruby and the Romantics moved over to Herb Alpert's A&M label, where they had a single release in April: "Hurting Each Other"/"Baby, I Could Be So Good At Lovin' You." While "Hurting Each Other" (originally recorded by Jimmy Clanton in 1965) made a poor showing at #113, it would become a #2 hit for the Carpenters in 1972. 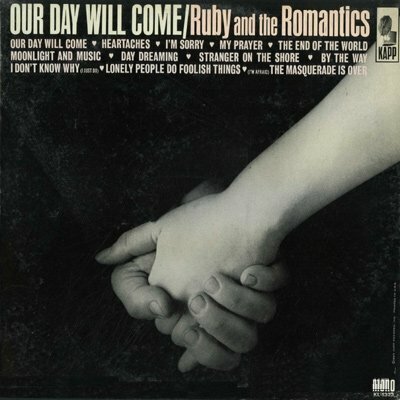 Clearly, with the exception of "Our Day Will Come," the Romantics' songs were better for others than for themselves. Strangely, there are three masters listed in the MGM master files from August 7, 1970: "Look At Me," "I Wanna Make You Feel Better," and "Baby, Let Me Take You On." These are all credited to Ruby & the Romantics, but Ruby says they never recorded for MGM, nor did she ever record songs with those titles. Not only did Ruby & The Romantics record these three sides, but I have them. In 1970, my friend Steve Feldman, along with Joey Levine, wrote these three songs to produce with Ruby and the Romantics for MGM. I suggested to them that they use Tom Bell to do the arrangements. The recordings were done in Philadelphia with Tom Bell at, I think, Sigma Sound. Ruby sang lead on all three. I think any of the three could have been a hit in 1970. Why they were never released, I don't know. The copies I own, unfortunately, are not very good. I made a copy from Steve's mono acetates on a cheap turntable, back in 1970. What I have now, is probably a third generation copy of the original tape. I would love to see them released legitimately. And that was about it. The Romantics struggled on until 1971. What happened? "We were just fed up. We weren't recording and the bookings weren't there." In addition, Ruby had been married for about five years and wanted to start a family. Whereas Ronald and Ruby returned home to Akron, Ed, George, and Leroy stayed in New York. Ed ended up working for a bank; George became a truck driver. Ruby raised her children and "then I worked for AT&T for five years." After that, she worked for the Salvation Army. Sometime in the 70s, Pickwick Records re-released three-quarters of the Our Day Will Come album. Re-titled Makin' Out, the LP was missing "Our Day Will Come," "(I'm Afraid) The Masquerade Is Over," and "By The Way." In 1973, Leroy Fann was killed in New York. Ed Roberts and George Lee have both died from cancer. Ronald Mosely had a series of strokes and passed away on December 3, 2011. 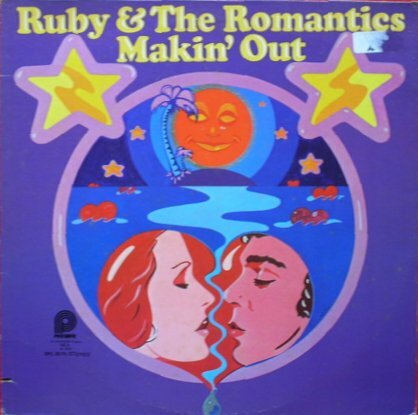 Ruby and the Romantics were good singers. Very good singers. But they were around at just the wrong time. American music was at a crossroads and they trudged down a path that few others were taking. Special thanks to Eugene Tompkins, Bill Daniels, and Jeff Beckman. Discography courtesy of Ferdie Gonzalez.